Superhero comic publishers are notorious for mistreating the people responsible for creating the properties that have gone on to make billions of dollars for corporations. The passing of Stan Lee back in November reignited conversations about his legacy, and how he used his position as an editor to take credit for Marvel characters and concepts that were largely created by his artistic collaborators. But this question of credit and compensation goes far beyond one person. In her new prose novel from Roaring Book Press, Comics Will Break Your Heart, cartoonist Faith Erin Hicks explores this history of exploitation through two teenage heirs of a fictional superhero comic, The Tomorrow Men, which is being adapted into a $200 million movie. The book takes its title from a quote from Jack Kirby—co-creator of Captain America, X-Men, Hulk, Iron Man, and many other iconic superheroes—and in this exclusive short comic, Hicks breaks down the novel’s plot and what Kirby’s words mean to her personally. The A.V. 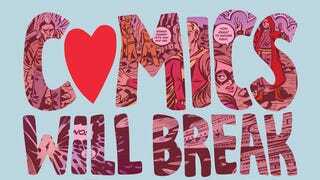 Club also has an exclusive excerpt of the first chapter of Comics Will Break Your Heart, on sale February 12, detailing the first meeting between the book’s teenage leads, Miriam and Weldon. Hicks does strong work creating the bookstore setting of Mir’s workplace, and the evolution of that store from selling novels and comics to housing a wide variety of pop-culture wares will be familiar to anyone who has visited a comics shop in the past few years. This first chapter establishes a romantic attraction between the two teens as Mir swoons over Weldon’s smile, but it also establishes how Mir’s family engages with art, setting up the capitalist conflict that will grow over the course of the novel. This teen romance gives Hicks the opportunity to teach younger readers about the inequality that pervades the superhero industry, and hopefully the lessons of the past will teach valuable lessons for future comic-book creators.